Vultr Free Credit promotion is BACK. It’s such a long time to see a new Free Credit program from Vultr. This time, you can get up to $28 in total. 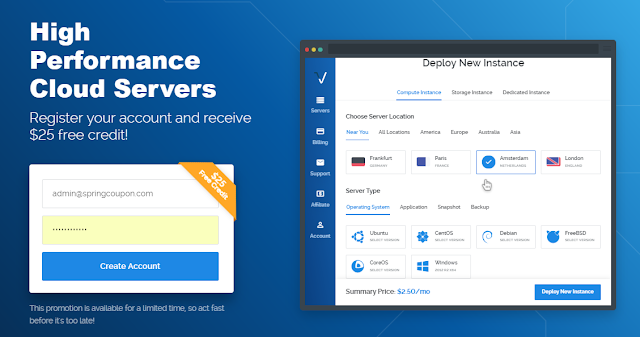 Vultr is one of the best high-performance SSD Cloud providers with 15 datacenters strategically placed around the world. If you wanna try VPS at this provider, let take advantage of this chance. Follow these steps below to get $25 free credit. Plus with $3 free credit from Vultr’s Twitter Promotion, you will have $28 FREE Credit to explore Vultr. 1. Press button above or visit promo link. 2. Fill in your Email and Password, Click Create Account to make a new account. 3. At Billing page, add your PayPal account or Credit Card to verify and take your $25. – This promotion is available for new customer only. – Don’t create more than 01 accounts or Vultr will block all of your things. – You will be charged $2.5 in advanced to verify but this amount will be back in a few weeks.